October is the time for autumnal hues, low light and the last blast of bright colour to fill our borders before winter arrives and knocks the whole lot back until next year. There is still much interest happening in the garden and its not quite time to hang up the tools and forget about the garden just yet. Make the most of the better weather and start preparing your garden for its winter hibernation. 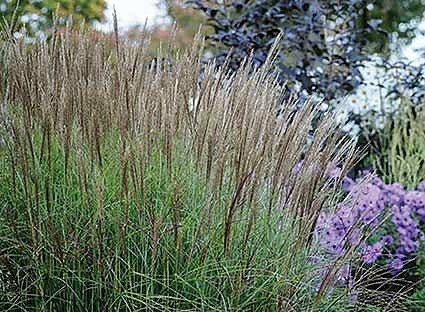 Miscanthus has to be my favourite species of ornamental grass, so much so that I have already introduced another variety in one of these articles a few years ago, Miscanthus Graccillimus. With so many cultivars to choose from there is a variety to suit almost every corner of the garden. The genus name, Miscanthus is derived from two Greek words, mischos (stalk) and anthos (flower). Sinensis means 'of China.' The common name for the plant is known as Maiden Grass. Plants form a graceful, upright mound of narrow green foliage that stays attractive from summer right through the winter. Coppery-pink plumes appear in late summer and the foliage dries and turns a light tan shade for the winter. Miscanthus is easily grown and is tolerant of a wide range of soils from well-drained sandy soils to the heavy clay. It does prefer full sun but can be grown in part shade too. It can be used in gardens where there are problems with resident deer and rabbits and another of its great attributes is that it requires little maintenance – one hacking back a year is all it requires. Kleine Silberspinne is compact and doesn’t take up too much space. It has narrow, silvery leaves which have a white stripe down the centre and masses of upright, feathery, reddish-brown plumes fade to silver in the autumn. When the flowers catch the evening sun, the plant appears to be sitting under a silvery halo. I often use Miscanthus 'Kleine Silberspinne' as a textural filler for shrub borders, as the contrasting structure of the spiky grass help to break up the contrasting “mound” formation of the shrubs. However, I also use this grass to bring colour and form to herbaceous planting too. It can look great with a clump of Sedum, as well as mixing with other herbaceous plants like Agastache, Echinops and Salvias. • Mulch borders with compost if not done in the spring. • Continue deadheading if weather is mild. • Remove fallen leaves from Roses to prevent Black Spot. • Continue to tidy borders of weeds and leaves. • Transplant any plants that need to be moved. • Plant spring bulbs such as Daffodils etc. But NOT tulips – wait until November to avoid tulip blight. • Lift and divide perennials. • Plant up containers etc for winter bedding displays. • Apply autumn lawn feed etc. • Now is a good time to plant trees and shrubs – the soil is moist and warm. • Sow sweet peas under glass. • Can lift summer flowering bulbs/tubers and overwinter in greenhouse or can heavily mulch plants and leave in the ground. Eg. gladioli, dahlia, canna. • Cut back herbaceous perennials as they die back. • Prune climbing roses to avoid wind rock. • Refill bird feeders regularly. • Install insect hotels/log piles. • Apply fleece to late season crops when frost is forecast. • Lift and divide rhubarb. • Clear away old foliage of strawberries to prevent pest and diseases. • Pot up herbs and take into frost-free greenhouse or windowsill to continue cropping through the winter. • Complete planting onion setts and plant out spring cabbage. • Harvest squash and pumpkin if not already done.